This is one of the cleanest hostel I have stayed at. Great location, good breakfast, super friendly and helpful hosts. Can't recommend the place enough! Great hostel ! Helpful team and delicious breakfast !! Thanks. I spent an amazing stay at the Marco Polo hostel. Everyone is so nice and helpful, and the place is so cozy, you will feel like visiting friends. I highly recommend staying there, and I look forward to going back myself! Really friendly and cosy atmosphere, excellent staff, perfect location. You will just want to extend your stay for sure. I had iranien dinner during my stay and it was absolutly fancy, welcome and delicious. Plus, the shower is hot enough and get pressure which I've really appreciate. 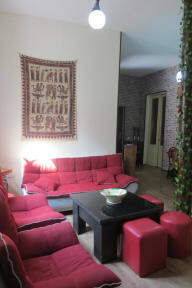 Very nice hostel to stay close to the busy area: close to bars restaurants and clubs. The staff was very welcoming and super helpful ! Parfait. Un petit bijou, à tel point qu'on en vient à espérer qu'il reste assez anecdotique pour ne pas perdre de sa valeur ! Andrew et Mina sont adorables, les locaux sont très propres, l'ambiance chaleureuse et familiale, et c'est très bien situé. Very nice hostel. Owners are nice and helpful. Definitely a great place to stay in Tbilissi.